North Shore Dish » Joey C.
The ever-so-charming Joey C. of Good Morning Gloucester steered us to Fort Square Café last weekend when we were looking for a casual place for breakfast. Not surprisingly, he was right on the money. With great food, local specialties, and counter staff that greets you like a long-lost sibling, this place is right up our alley. The breakfast menu at tiny Fort Square is extensive and served all day. It includes eggs, omelets, and pancakes served with various breakfast meats and choice of hash browns or home fries. We tried two specials that day and loved them both. Crispy french toast ($5.50) was coated in crushed Honey Bunches of Oats and perfectly cooked. A side of bacon was crispy and flavorful. The tasty Portugese scramble with peppers, onions, and chorizo, home fries, and toast is $8.50, but we guarantee you won’t need another meal that day. We also sampled mudiga steak, a local favorite consisting of thin slices of beef that have been breaded and fried. For fisherman, or those who like to eat breakfast like one, the steak is served with eggs, hash browns, and a toasted roll. Those not quite as adventurous might enjoy it more for lunch. We saw a steak sandwich with roasted peppers and melted provolone go by that looked delicious. 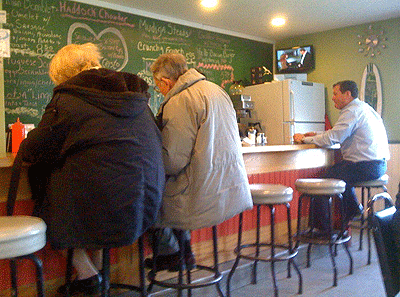 Many other sandwiches are available for lunch ($4.50 to $6), and we’re hoping to return to check out the chowder.